With The Walking Dead growing long in the tooth, AMC is in need of a new hit. Enter the new Lodge 49 TV show. With this modern-day fable, has the cable network hit upon the formula for Nielsen ratings gold? Will Lodge 49 be cancelled or renewed for season two? Stay tuned. *Status update below. An AMC drama, Lodge 49 stars Wyatt Russell, Brent Jennings, Sonya Cassidy, Linda Emond, David Pasquesi, and Eric Allan Kramer. The series centers on Sean “Dud” Dudley (Russell), an aimless former surfer who has been floundering through life. Following the death of his father and failure of the family business, Dud joins a mysterious fraternal retreat which offers cheap beer and strange alchemical philosophies. Now, thanks to the mysterious lodge and its members, he starts to find a sense of purpose and begins to acknowledge both his hopes and fears. What do you think? Do you like the Lodge 49 TV series? Should it be cancelled or renewed for a second season on AMC? *10/4/18 update: AMC has renewed their Lodge 49 TV show for a second season. Details here. 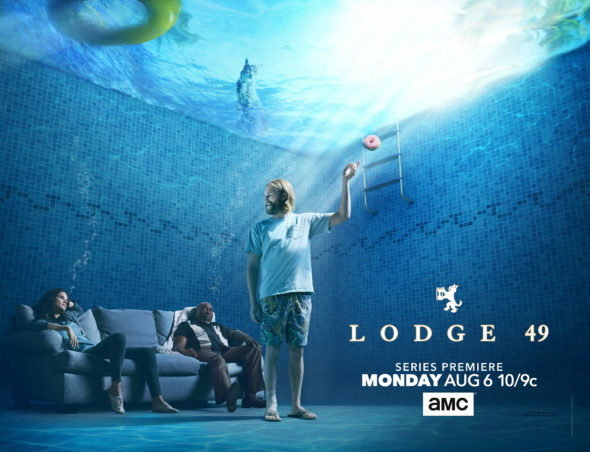 Lodge 49: Is the AMC TV Show Cancelled or Renewed for Season Two? I love the quirky characters, who are so well developed. It would be a real loss for the Lodge to be cancelled in its infancy. I think as more people hear about it and start watching, it will develop a large fanbase – Not just us weirdos who have been lucky enough to find it already! Please do not cancel this show I really enjoy it a lot! I’m very impressed with the level of acting and also with Wyatt Russell I know he comes from good genes being Goldie Hawn and Kurt Russell’s son. I have rewatched almost every episode because it is definitely pulling me in if there is a way to try to get the show to not be canceled please let me know I would definitely do a petition which I’ve never done in my life or help advertise on my Facebook page which I have around 5000 friends! Please keep this show growing! It is such an original concept…..in addition to being SO special in so many ways….the writing, acting, direction, cinematography are ALL excellent!